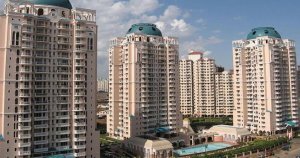 DLF Carlton Estate is high rise residential apartment complex comprising 485 apartments located in the prime location of Phase V of DLF City on the Golf Course Road, Gurgaon. One can avail the twin benefits of living in the 3BHK and 4BHK luxurious apartments amidst verdant green environment in a healthy and comfortable way and also get the conveniences of shopping into the nearby shopping malls like South Point Mall. It is well connected to the Gurgaon-Faridabad Road, Gurgaon-Mehrauli Road, NH-8 and Indira Gandhi International Airport which is just 25 minutes drive from the DLF Carlton Estate. The City Club, Paras Hospital, and a number of highly reputed schools like Lancer International, Shiv Nadar School and colleges are in close vicinity, which makes education and entertainment all easy for the dwellers. Gurgaon Railway Station and Inter State Bus Terminus of Gurgaon is just 15 minutes drive away which obviously provides easy commutation to any place. The apartments of DLF Carlton Estate are designed in such way that they always get plenty of fresh air and natural light which is very essential for healthy living. Cement plastered walls in living rooms, dining rooms, bed rooms, lobby and passages, and white mosaic/terrazzo floor provides classy look to the interior of the apartments. The floor of the toilets are made up of ceramic tiles which give them durability and excellent look. Exquisite combination of ceramic tiles, mirror and oil bound distemper paint on the walls gives fantastic look to the walls adding to the beauty of the interiors of the apartments. Granite counters, durable floor tiles, stainless steel single bowl, single drain board sink in the kitchen not only gives it a beautiful look but also enriches the cooking experience. Teak veneered flush doors and pressed metal windows add more beauty and security of the apartments. Modern multi-tier security systems with CCTV cameras installed at all prime locations; guard rooms at all entry and exit points, intercom facility in all the apartments. Swimming pool with changing room facility. Modern and well equipped health club and Gymnasium. Round the clock power back up. Fire extinguishers and fire alarms installed in all the chief locations. Ample parking space for both residents and visitors. Proper boundary wall all around the periphery. Exclusive Recreational Facility like TT, Badminton and Basketball courts. Community Shopping center and Health Care Center with in the premises. Early learning Center and Nursery schools within the boundary. World class water drainage facility. To sum up, DLF Carlton Estate provides an ideal option for those looking for luxurious apartments in Gurgaon amidst the natural greenery with easy connectivity to other important places.